Q1: What information do I need to furnish to receive the most competitive rate and protect my interest when shipping through DGX? Q2: Do all customers need to submit a credit application for a shipment? All new customers interested in obtaining credit status (Billed Prepaid or Collect) must submit a completed, signed and dated Dependable Credit Application. New customers may remain on driver collect or prepaid in advance, if they wish to do so. Q3: What is required on the Credit Application? Q4: How much time does the credit process take? Completion time for a final credit limit decision varies on customer information provided (including all required answers) and the amount of time for references to be returned to the credit department. Any special invoicing, instructions, procedures, billing requirements, addresses or other specifications requested by the customer must be submitted in writing for approval prior to inclusion as part of our Special Billing Instructions. Notwithstanding the above, our goal is to process your Credit Application within one week. New customers should understand that unless credit is established prior to the commencement of service, all first shipments must be prepaid in advance (or driver collect, depending on freight payment terms) while the credit review process is undertaken. Q5: How do I compute dimensional weight for air freight shipments? Q6: How do I compute cubic meters? In order to compute actual cubic feet and convert it to cubic meters, you will need to measure the length, width and height (in inches) of each piece to be shipped. One cubic foot is equal to a single piece with the dimensions of 12" x 12" x 12". To compute cubic feet, first multiply together all the dimensions for the piece being measured. Then divide the total by 1728. This calculation will give you your total amount of cubic feet for the piece. 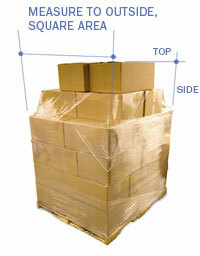 Total the individual pieces “cubed” to determine your total shipment cube. When taking your dimensions, round up to the next highest inch. Example: 11 ½" = 12". Total cubic feet should always be rounded up. Example: 10.45 cubic feet = 11 cubic feet. When calculating cubic feet for a shrink-wrapped pallet, measure the highest, widest and longest dimension of the pallet. If the product does not take up the full amount of space on the pallet, you must still measure the width and length of the pallet itself, as well as the highest point of the product on the pallet. This is because your pallet is using the space within the container. Should the product hang over the edge of the pallet, you will need to measure the length and width of the product stacked on the pallet as the largest dimensions. When calculating cubic feet on shipments that consist of multiple pieces having different dimensions, compute the amount of cubic feet for each piece and then add up the cubic feet for all the pieces to determine the total cubic feet for the shipment. You do not need to round up the measurement for the individual pieces. Round up the cubic feet total of all the pieces added together. International “less than container load” (LCL) rates are quoted on a weight/measurements (w/m)—revenue ton basis. A revenue ton is defined as 1 cbm (m3) and/or 1000 kg. The basis for the calculation is whatever yields the greater revenue. To determine weight in kilos divide gross weight by 2.2046. Every 1000 kilos is considered a one CBM. The higher of actual measurement of the cargo or 1 CBM for each thousand kilos is used to determine the CBM for billing purposes. Q7: What is the cut-off time for delivering freight for a particular sailing? There are many different cutoff times for the various trade lanes DGX services, as well as the wide range of origin locations we are able to accommodate. For international shipments, cutoffs vary considerably depending on destination and the wide assortment of sailing schedules. Click Here to see our Guam and international sailing schedules. Please call our International Customer Service Department for LCL shipments at 888.488.4888, Ext. 2005, or our International Customer Service Department for FCL shipments at 888.488.4888, Ext. 2015 for specific cutoffs and late gate availability. For Guam, freight sails once weekly and the cutoff is Monday at 5:00 pm. Click here for the Guam sailing schedule. For shipments originating outside California, our Customer Service Representatives can arrange next business day pickup anywhere in the continental United States for Less than Container Load (LCL) service into Los Angeles. Freight will be scheduled into our closest CFS to depart on the next scheduled cutoff to Los Angeles. Please call our Customer Service Representatives for LCL shipments at 888.488.4888 Ext. 2005, or for FCL shipments call 888.488.4888, Ext. 2015 for information on pickups and transit times across the country. Freight that has special stowage requirements, such as hazardous materials, may be subject to delay even when delivered prior to cutoff. For container load service, multiple port options may apply. Please call 888.488.4888 Ext. 1359 to discuss various alternatives, cutoffs, etc. DGX has the ability to be flexible in order to meet your ocean or air needs or specialized needs. Please call our Customer Service Department at 888.488.4888 for any special requests you feel you might need. Q8: How should I mark my freight or fill out the Bill of Lading (BOL)? When preparing your shipment, it is always best to mark the full address information of both the shipper and consignee on all pieces of the shipment. At a minimum, marking each pallet with complete information is recommended. Marking the pieces of the shipment with the piece or pallet count is also very helpful. If your shipment carries a booking number, PO number, house bill number, shipment reference, etc., mark this information on the freight as well. We will mark the freight and the BOL with our pro number when your shipment is tendered in order to provide complete track and trace visibility throughout our system and our website. For international shipments that are pre-booked, the booking number will follow the shipment as the DGX pro number. Bills of Lading (BOL) should be prepared to accompany all shipments. It is important that the type of service be specified (ocean vs. air) if a DGX ocean or air BOL is not used. All fields should be completed to ensure the proper handling of your shipment. Any pre-arranged quote or booking number is essential to ensure proper billing. Any missing or incomplete information may result in a delay while we attempt to verify items and fill in the blank forms prior to shipping. For shipments originating outside California, the consignee address should be listed as 19201 Susana Rd., Rancho Dominguez, CA 90221. The final offshore destination consignee information should be written into the body of the bill or special instructions section. For a fax copy of our standard BOL, please call our Customer Service Department at 888.488.4888, ext. 2004 or print it directly from the website. Q9: When receiving a shipment, what should I do? First, check the freight for shortages or signs of damage. If you discover a problem, immediately bring it to the driver’s attention. A signature and date of the person receiving the shipment is required on the delivery receipt. Please note: Unless otherwise noted, by signing this receipt you are declaring that the goods received have been delivered in good condition. Should there be an overage, shortage or any damage of shipment, immediately alert the driver and make a notation on the delivery receipt to the nature of the discrepancy. Your exception should include identification markings such as item description, box markings, serial numbers or model number. A complete description should be noted (e.g., one carton of item #2030, ceramic tiles, damaged). When a unit (carton, box or pallet) shows no sign of damage, and damage or loss is noticed after the driver has left the premises, the recipient is responsible for reporting the loss or damage to the local office immediately and requesting an inspection within 3 working days of the delivery date. Every attempt should be made to leave the unit and packaging materials as they were when you discovered the loss or damage. Unless notice of loss or damage is apparent and the nature of such loss or damage is not given in writing, DGX will deem that goods were received in good and damage free condition. Q10: Are my shipments automatically insured? No, shipments are not automatically insured unless insurance is purchased. DGX can arrange insurance upon request. In accordance with the Carriage of Goods by Sea Act, the ocean carrier’s liability for loss or damage to the goods shall be limited to USD $500.00 per package (or customary freight unit). In the case that the shipper declared over USD $500.00 or higher in value of goods (per package/unit), not to exceed the lower of cost or market value, a surcharge will exist based on declared value. Based on customer request, DGX can purchase additional freight insurance in the event that a higher value has been declared on the Bill of Lading. Liability for loss shall not exceed the value declared and any partial loss or damage will be adjusted pro rata on the basis of the declared value. With respects to international shipments by air, the maximum liability of the air carrier and indirect air carrier is subject to Montreal Protocol 4 or Warsaw Convention which limit the carriers liability to 19 SDR’s per kilogram (approximately USD 28.00 per kilogram), or in the case of Warsaw Convention USD $9.07 per pound. Shipment sent by domestic air freight are generally limited to USD $0.50 per pound (lb). Liability for damages and shortages of personal effects and used household goods will be limited to a release value of USD $0.10 per pound. Note: Despite the legal financial liability imposed on carriers and forwarders and although shippers may declare a higher value, carriers, indirect air carriers, forwarders and NVOCC’s are only liable when loss or damage is proven to have been caused by their negligence. Losses outside DGX and/or the carriers control may not be covered and therefore cargo insurance should be purchased. Note: The word “package” is defined (but not limited to) 1) a container used to ship household goods, 2) freight shipped under a lump sum tariff, 3) a liquid tank or a dry bulk container, 4) van or trailer and 5) cargo shipped on a skid, cradle, pallet or unitized load, group or assemblage. Q11: What kind of insurance will be best for my shipment? Cargo insurance can be broadened or scaled down directly impacting on cost and coverage. Since different commodities run different risks, we can arrange to have your coverage customized to your needs so that your financial interest is better protected. This coverage protects you from stranding, sinking, burning, collision, jettison, washing overboard and general average damages. “With Average” coverage expands FPA coverage to include partial and total loss due to heavy weather at sea. In most cases, coverage for theft & non-delivery to “FPA” and “With Average” can be added for an additional premium. Theft & non-delivery may not be available on certain commodities. All Risk is the most common insuring condition for international cargo insurance and is available for most new general merchandise. It generally insures product door to door and while in temporary warehouse locations during the ordinary course of transit. Cargo insurance policies may be broadened to include coverage for a wide range of broader insuring conditions as needed. Expand Time Duration of Coverage beyond the 15- and 30-day time limits imposed by the warehouse to Warehouse Clause may remove the time-line altogether. Strikes, Riots and Civil Commotions Damage resulting from strikes, riots and civil commotions risks may be covered by an endorsement to the open cargo policy. The S.R. & C.C. Endorsement covers loss or damage to the property insured caused by strikers, locked-out workmen, those taking part in labor disturbances, riots or civil commotions, vandalism, sabotage and malicious acts. War Risks. An open policy insuring against war and similar risks may be issued as a companion to the marine open cargo policy. It covers most of the perils arising from hostilities, but excludes loss or damage resulting from the hostile use of nuclear weapons. Coverage against major war perils applies only while the cargo is aboard the overseas vessel, but coverage against damage from mines and torpedoes also applies while cargo is aboard lighters or other craft, prior to or subsequent to the ocean voyage, or at a port of transshipment. Q12: How much time do I have to file a claim? The following time line is representative of the majority of cargo claims. There may be exceptions in the time to file a claim depending on mode, geographic scope, cause of loss and changes in statutory requirements. Please refer to the carriers' terms & conditions, and statutes for specifics. Regarding the DGX cargo policy, it requires that claims be filed against carriers in accordance with statutory requirements. Q13: How do I file a claim? All claims for loss or damage of cargo must be filed with DGX - Dependable Global Express which will be solely responsible to process them to conclusion. Once the claim is received and recorded, notification with the identifying claim number will be mailed within 24-48 hours. Please contact the Claims Department at 888.488.4888 or via email for inquires pertaining to your claim. Click here for the DGX Presentation of Claim Form. Standard Presentation of claim or letter identifying the shipment and the claim amount. The claim form or letter must include the full name and address of the party filing the claim. A copy of the seller or vendor’s original invoice documenting the amount paid for the goods after any discounts or deductions. Detailed repair invoices, if goods in question have been repaired. The labor charges should be broken down by the amount of hours and hourly rate. Q14: What are the benefits of arranging your cargo insurance with DGX? DGX affiliates with our licensed agent in compliance with applicable state and country laws for the convenience of our customers. Q15: What are the DGX Freight Terms and Conditions? Due to the vary of all shipments, please visit our policy page for our Terms & Conditions services that apply to your shipment. Q16: What does ISO 9001 Certified mean to DGX and the service I receive? DGX management recognizes the need to continually improve its foundation for quality services. It is through the International Organization for Standardization, an international accreditation body, that DGX continues to build its foundation for quality and customer satisfaction. Implementing quality controls, documenting the various processes and procedures and focusing on quality of service and customer satisfaction are fundamental aspects of ISO. We have successfully implemented and have maintained this quality foundation. It is followed by everyone in the organization, increasing our efficiency and productivity with an emphasis on measuring results and continuous improvements. Through ongoing audit inspections with an ISO registrar, DGX management can assure company personnel and our customers that we have adopted and comply with high quality standards recognized worldwide. Q17: What documents are required for international shipments? Click here to classify your product. Please note, certain foreign destinations may require Import Permits. We will be able to assist with any special requirements. For questions, please contact International Customer Service at 888.488.4888, Ext. 2004 (Imports) or Ext. 2005 (Exports). WCA (World Cargo Alliance) is an organization dedicated to networking transportation firms from around the world. The WCA members in other parts of the world unite with us as agents where we do not have our own offices. Today, the group encompasses over 6,000 members, all freight companies, with firms ranging from customs brokers, air and ocean freight forwarders to consolidation and project specialists. Global transportation regulations, customs procedures and policies are often in flux. Our membership ensures that our clients, as well as our staff members, are educated on these changes. The WCA provides us with the ability to service all locations worldwide through membership representation on a global basis. Q19: What information must be provided with a shipment that contains hazardous materials? A completed IMO Dangerous Goods Declaration and Material Safety Data Sheet (MSDS) must be provided in order to comply with Federal and Coast Guard Regulations. Q20: What documents are required for Guam shipments? Guam Customs requires that we provide commercial invoices for each shipment in a container prior to vessel arrival. Due to issues in enforcing such a policy, invoices supporting your shipments must be tendered to our Guam office at least three days prior to vessel arrival. The commercial invoice should be faxed prior to vessel arrival to 671.649.7777. Failure to complete these guidelines will result in your shipment being placed into our Guam Customs-licensed CFS and storage fees will accrue daily. A crate or thin shipping unit with legs, usually 2x4's, nailed or attached to the sides that stick out to help the crate stand upright on its own. These are assembled by the shipper and are either picked up or dock delivered. When shipped, these units take up space additional to the crate itself as the legs stick out the side at an angle, like the shape of an “A.” When we cube these types of shipments, we use the actual dimensions of the crate without the legs and then add 25 cube to the total to account for the additional space used by the legs. The addition of 25 cube is a standard for most crates. For example, a crate 108" long by 60" high by 6" wide is 23 cube. Add 25 cube and the shipment is billed as 48 cube. This is often less than what the cube would be if we used the longest dimensions. In this example, if the legs make the width 30", the total cube would be 113 cube, or 66 additional cube. A metal or wooden framework that is a stand-alone structure to which crates or slabs are strapped or banded. These shipments are most often picked-up at a shippers location where they are able to attach the shipped items to the structure securely. When we cube these types of shipments, we use the longest of each dimension for the whole shipping unit (crates, frame and all) and then divide the total by 1.5 to account for the space around the top of the A-frame structure. For example, if the A-frame is taller than the crate, use the height of the frame. However, if the crate is longer than the frame, use the length of the crate. The Customs Trade Partnership Against Terrorism (C-TPAT) is a joint government and business initiative designed to strengthen overall supply chain and border security. The goal of C-TPAT is to create a more secure supply chain through cooperative partnerships between government and business. To learn more about C-TPAT, visit here. Q23: Who participates in C-TPAT? Partnership in C-TPAT is voluntary. Participants include supply chain members such as importers, brokers, carriers, terminal operators, warehouse operators and manufacturers. Q24: What does participation in C-TPAT require? C-TPAT participants must submit a supply chain security profile for review by Customs and Border Protection (CBP). The security profile must address C-TPAT security guidelines that include: Procedural Security, Physical Security, Education and Training, Access Controls and Manifest Procedures. Additionally, C-TPAT participants must undergo a validation process through which CBP officers validate the supply chain security profile that was submitted and address security gaps as well as corrective measures to improve supply chain security. We have undergone the validation process and are validated. Q25: What are the benefits C-TPAT? C-TPAT provides businesses with an opportunity to play an active role in the war against terrorism, while improving processing times for imports and increasing overall security for their employees, suppliers and customers. Q26: Is DGX a member of C-TPAT? DGX is a C-TPAT participant. Our Status Verification Interface number is “dhxCon01084”. Q27: What are Import Transit Times? This is dependent on a variety of factors including carrier transit times, country of origin, city of destination and shipping cutoffs. Please contact our Import Customer Service Department at 888.488.4888 Ext. 2003 for further information on specific original destinations. Q28: What makes us different? We believe our flexibility, integrity and employees set us apart from industry competitors. Our employees work diligently to ensure customer needs are met and surpassed. We also believe that by helping the customer, it’s ultimately helping the company. Therefore, flexibility and pricing needs are important to us, as are honesty and integrity in ensuring that we take care of your business and needs. Our growth in the industry indicates we’ve been doing business better than the competition.